As a kid, I loved figures like Dr. Impossible - characters who had virtually no characterization in the cartoons or comics, and were basically an open template for whatever I wanted them to be. To the best of my knowledge, DI has had one single appearance in the DC Universe, in the Justice League of America storyline "The Tornado's Path." His real name, origin, and even the extent of his powers are unknown. And now that Grant Morrison has shipped the New Gods off to Earth-51, it's possible we may never get the lowdown on DI (yeah, right...). Who is Doctor Impossible? On the surface, he appears to be a dark, mirror-image of Mister Miracle. Where Mister Miracle is aided in his fight against evil by a personal super-computer known as Mother Box, Doctor Impossible accomplishes his evil deeds with the help of his "Father Box." Doctor Impossible claims to be Mister Miracle's brother from Apokolips. Origins aside, Doctor Impossible remains a formidable foe and disturbing flipside to the powers of Mister Miracle. I find it amusing that the character with the least history gets the longest packaging bio yet. Dr. Impossible is a fairly straight repaint of Mister Miracle, who I'll review later in the week. He's missing Miracle's belt. 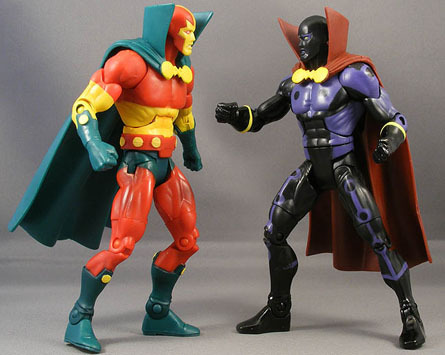 It's a credit to Mattel and the Horsemen, though, that both DI and Mister Miracle have unique heads - the edges of their respective mask decorations are actually sculpted. One thing to point out is the clasp on his cape. While not evident in much of the comic art, it is on the DC Direct figure, so apparently it's part of DI's official design. There is one part of the sculpt that's inaccurate to the comic version: it's missing the segmented bits on the sides of the torso. It's not a big deal to me - I don't think a character like Dr. Impossible really merits much retooling - but it's worth noting. While some of the large-collared capes haven't worked as well as I'd like (Red Tornado's, for instance), DI's looks good. 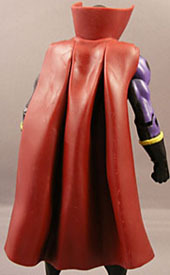 The figure is primarily molded in black plastic, with a purple trim. I really like this color scheme - well, I just really like purple, frankly. The trim is applied relatively cleanly, although mine is missing the purple trim around the left side of his right calf. I'm a little disappointed with the yellow paint on the cape clasp, which is a bit gloppy and looks like a couple of frosted cookies. 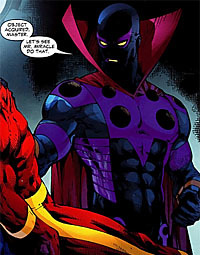 The cape is somewhat pliable, unlike Mister Miracle's, which could be used to hammer nails. But other than the paint slip-up mentioned above and a slight looseness of his joints (particularly his ab crunch and waist), there are no significant QC problems. For whatever reason, Dr. Impossible gets no accessories except the Kalibak limb (right leg, just like his twin). At the very least, a "Father Box" would have been nice. Mister Miracle has lots of accessories we'll talk about when we get to his review - maybe the budget for both of them was spent on him? Dr. Impossible is exactly the sort of repaint figure I like - he's a new character, but obscure enough that if you don't care about him you can skip him (and still get the Kalibak piece with Mister Miracle). But his design and colors make him one of the more interesting pieces in my DCUC collection. And I'm a sucker for evil twins.